There will be water stations on the route at the finish, passed on each lap, at which water will be provided in recyclable plastic cups. The course begins on the upper pathway and heading north for approximately 1km before turning back onto the lower perimeter road. It then continues back to the race village for approximately 1.5km followed by one complete clockwise lap of the reservoir. The race, predominantly on tarmac pathway but including loose gravel in places, is suitable for runners of all abilities. Marshals will be present on the course throughout the race. The route will be clearly indicated with arrows, tape and Km markers where necessary. For collection at registration on the day only, numbers will not be posted. On-site parking available: £4 all day or £3 for 2 hours. Spectators are best placed around the finish area where they will see runners pass at the end of each of the the part/full laps. Pacers will not be offered at this race. We opted for the evening race due to work (had the 7th fallen on a weekend, I suspect more people would have done both the morning and the evening races)! Friendly, local race atmosphere and a nice distance for newer runners. One flat loop - a few undulations but no hills, so it's a nice fast course if you want to give it a blast! The only downside was that it took the lower path rather around the reservoir (there is an upper path alongside the water which offers lovely views), so for a lot of the race, you can't actually see much of the reservoir! Would do this one again, and would like to do the two races in the same day. 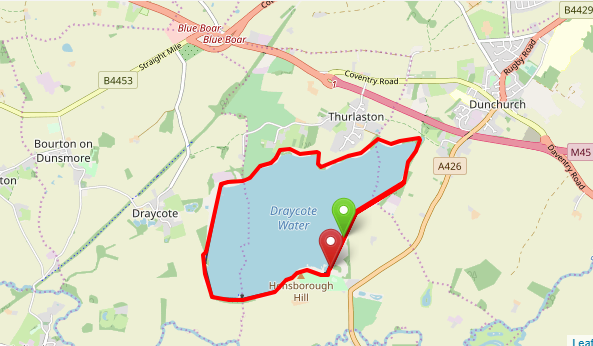 This is actually 2 races over the same course at Draycote Water. Both races are 7km but one race is at 7am and the other is at 7pm. You can enter either or both. I opted for both.The course is undulating but this is offset by the scenery around the reservoir.The evening race was obviously far bigger than the morning race, so this gave a different flavour to each race.The organisation was excellent and the organisers were very friendly and helpful.A bonus of running both races was that the medals were actually different. There was also a good quality t shirt and a reasonable goody bagDefinitely a must do again race!